Hanging out with toddlers and preschools is a delight. They’re at such a wonderful age, as they’re discovering the world and developing their language. Conversations at this age are so fun, and playtimes are full of wonder and imagination. But…. toddlers and preschoolers are also busy, full speed ahead, into everything, all the action, all the talking, all the time. Sometimes they and, dare I say it, we parents need a little quiet time. Time to rest, time to recharge, time to have a little space, and independence. This is where quiet bins come to the rescue. If you haven’t heard about quiet bins before, get ready to fall in love with them! A quiet bin is a box or container, with a clever, simple, engaging play idea inside. They give young children lovely invitations to explore, discover, and play, while developing important early skills. At the same time they can encourage independent play, giving you an easy spot in your day where you can watch your child play on their own while you tend to another sibling, do some chores, fix dinner, or even sit alongside and enjoy a hot cup of coffee before it goes cold! Quiet bins are win-win solutions. They offer your child interesting loose parts play, games, and activities that promote language, maths, and concentration. And they give you the solution to keep everyone happy when you do need to get on with some other tasks. Pull out a quiet bin and everyone’s happy. :: Want to know how to introduce quiet bins and use them as part of your daily routine? 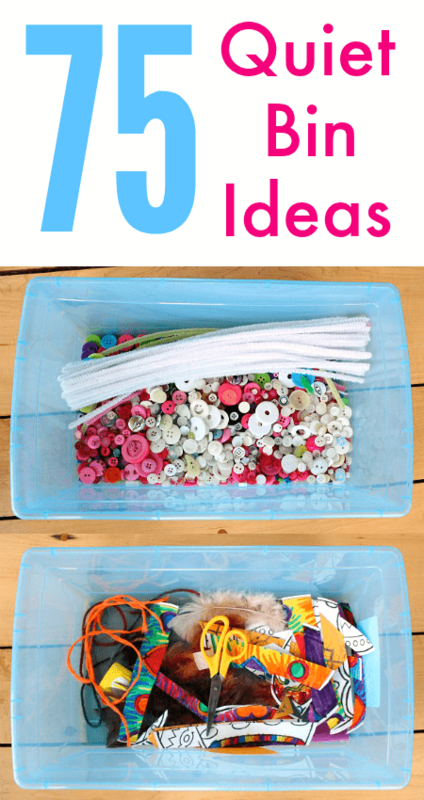 :: Want a whole year of ideas for what to put in your quiet bins, using really simple materials that are easy to get hold of? :: Want to encourage your toddler and preschooler to explore independent play, and build important skills through play? 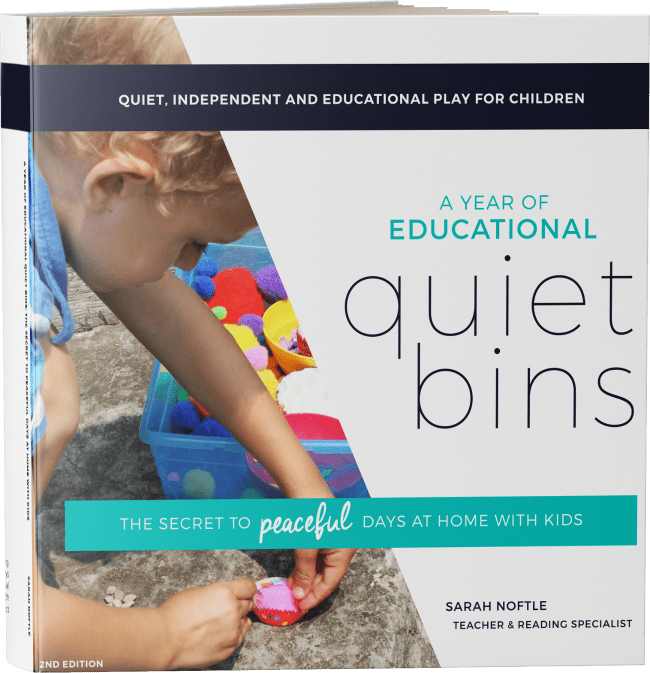 The new quiet bin resources from Sarah Noftle are perfect. Sarah has thirteen years experience teaching and raising children. She understands that children need to play, how to develop skills through this play, and how to fit educational activities easily into family life. 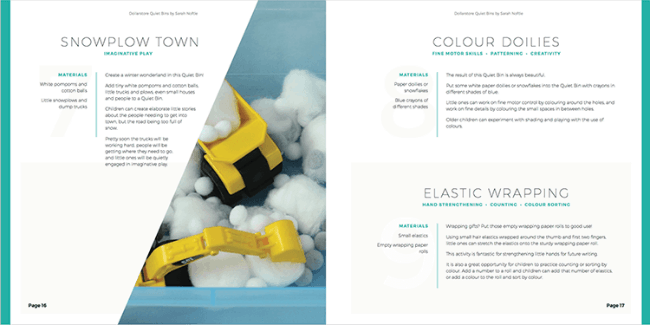 The ideas in these books aren’t busy work – they’re carefully selected by Sarah to ensure all the activities are based in play, and each quiet bin has strong educational value. :: how to set up quiets bins, with over 75 options, using simple and affordable materials. You’ll get a whole year’s worth of quiet bin ideas – over 75 in total – including ideas for winter, spring, summer, autumn, Easter, and Halloween. You’ll also have a range of any-time quiet bins that will help your child develop skills including matching, sorting, patterning, fine motor skills, critical thinking, imagination, and independence. A Year of Educational Quiet Bins is the first of the two-part resources. You can get your copy here. It costs $8 and will help you establish quiet bins as part of your toddler or preschoolers routine, and give you a whole year of quiet bin ideas to enjoy. Dollar Store Quiet Bins is the second volume. You can get your copy here. This book costs $8 and gives you 30 quiet bin ideas that you can put together with 9 items that are readily available in the dollar store. Click here to download volume one and here to download volume two. 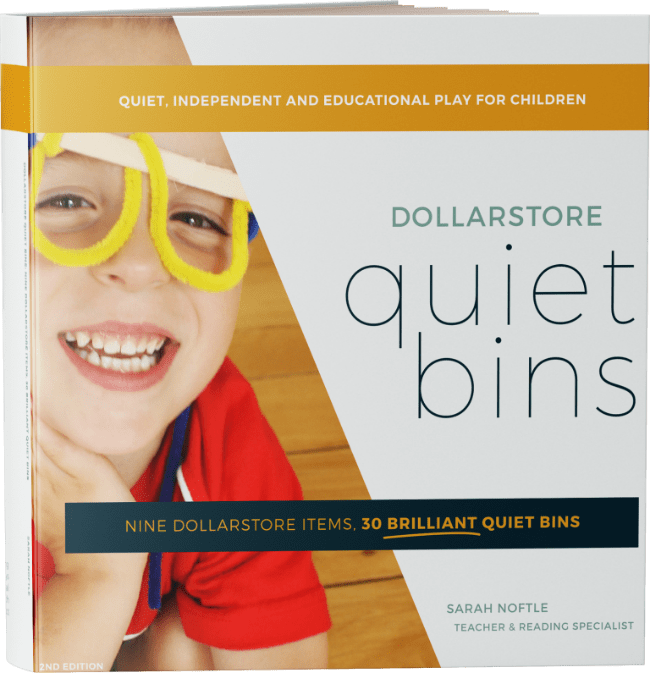 A Year of Eductional Quiet Bins and Dollar Store Quiet Bins are written by Sarah Noftle. The ebooks are sold by How Wee Learn, a third party seller. If you have any questions regarding your purchase please contact them directly on [email protected] NurtureStore accepts no responsibility for products purchased from third party sellers. These are ebooks, which means you will be sent a link that allows you to download a PDF containing the ebook and all the printable resources. You can save it to your computer or iPad* and then either read it on screen or print some/all of the pages, as you prefer.